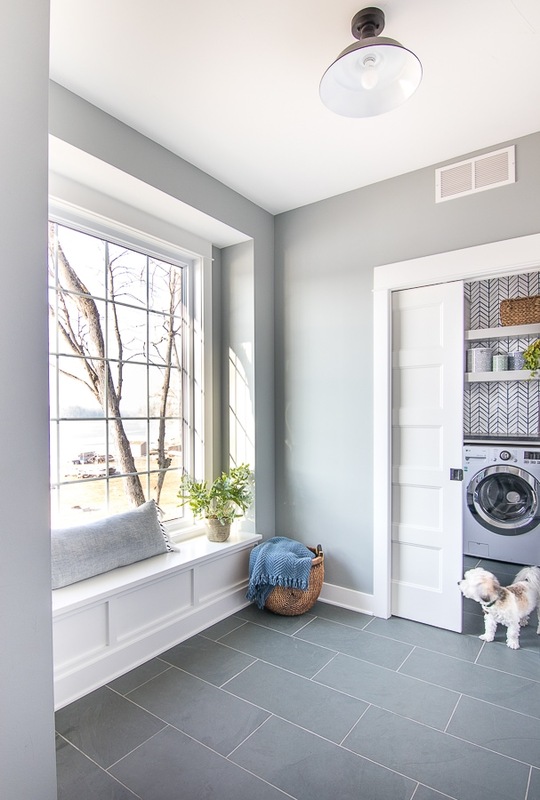 I’m not sure how this slipped by me, but the other day, I had a reader ask me about our mudroom, and I realized that I never officially blogged about it! I’ve shared glimpses here and there when talking about chores and organizing (see more about that here), but today I’ll finally get to all the details. This space is right off our garage so the kids can come right in and dump their stuff. It also acts as a hall to our laundry room and 1/2 bath. Bringing the groceries in is easy with access to the kitchen around the corner as well. I knew in this house I wanted all hidden storage. 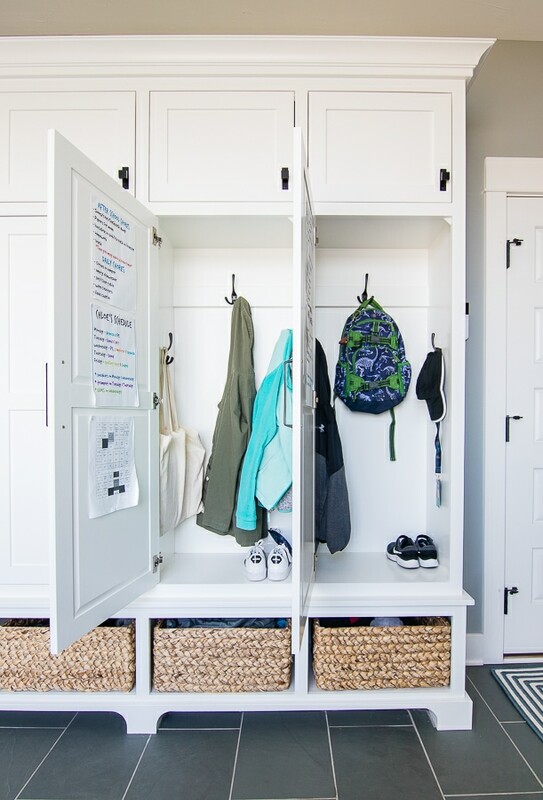 Those beautiful open style lockers and cubbies are so tempting because I love the look, but man they are so not practical with kids. We had open lockers at the last house and they looked like a hot mess all the time. You all know I’m kind of a neat freak, but unfortunately, my kids did not inherit this trait. Especially as they have gotten older, there is just more and more stuff. Backpacks, soccer bags, basketball uniforms, piano books, church stuff, shoes, papers, etc. They all need a place to go, preferably where I don’t have to look at them! This time around, I knew I wanted a simple design of a locker for each of us (the Mr. has just as much work stuff and books that he is constantly bringing home too). We chose cabinets on the top for seasonal items we may not be using that often and baskets below for easy to reach “what we need now” items. Once spring hits (or really hits despite what the calendar says), all the snow clothes will move up to the upper cabinets and the flip flops, soccer cleats, etc. will move down to the bottom baskets. I talked in this post here about how swapping out baskets instead of drawers not only saved a lot of money, but added so much more character and texture to this space. Plus, they are actually easier to pull all the way out and search for mittens if need be. After this winter, we are down to approximately 3 left mittens and a bright pink right one that no one will claim. One tip I did this time around was putting in low and high hooks in my kids’ lockers. They were constantly climbing in the cubbies at the last house because they couldn’t reach the hooks to hang up their stuff. They have no excuse here! They look really clean at the moment because my kids were at school when I shot this, so half of their stuff isn’t in here right now. I also have their school schedules, chore charts, and activities taped in here so they know what’s going on without me having to remind them constantly (you can read more about that here). This window seat over here was originally supposed to be a set of drawers too, but I decided the open space to move around in here was better than more storage. The seat is a great spot to tie shoes in the morning or take a nap while you wait for your little brother to finally finish his cheerios. This seat has such a pretty view when the ice is melted on the lake and that tree is full of leaves. Charlie’s toys stay in this basket over here, which he routinely tips over and scatters everywhere – he is definitely the messiest kid in the house! We went with slate tile in here that carries through to the laundry room and bathroom. I have had a few questions about whether this shows dirt more than a lighter tile, and I’d say in the winter it does, but it’s still worth it to me because I love the classic look. 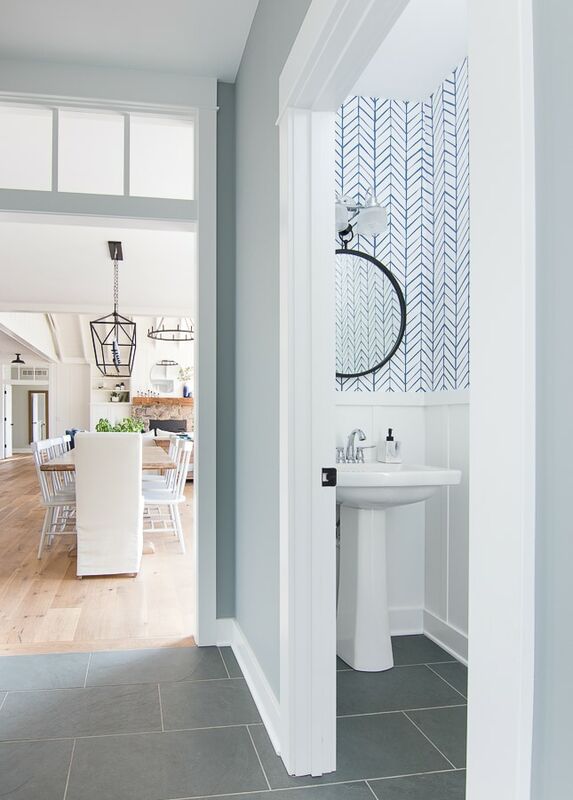 The transom detail was a fun touch to add both here and above our master bedroom doors. 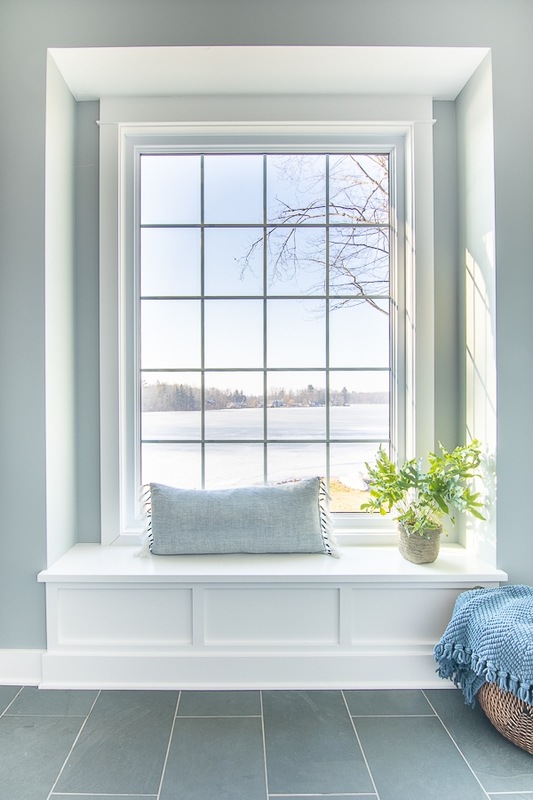 They aren’t actual windows – the trim guys built casings for them and inserted the glass. There you go, one more room down! I think the last room I have to share is my son’s bathroom? Which maybe I’ll finish one of these days. Toy Basket – I’ve had it for 15 years, no clue! Wow. What a beautiful mud room! I love the view out that window! Looks like a picture. Thanks Kim, the ice melted off the lake this week and it’s so pretty to see the water out there again. What a beautiful space. 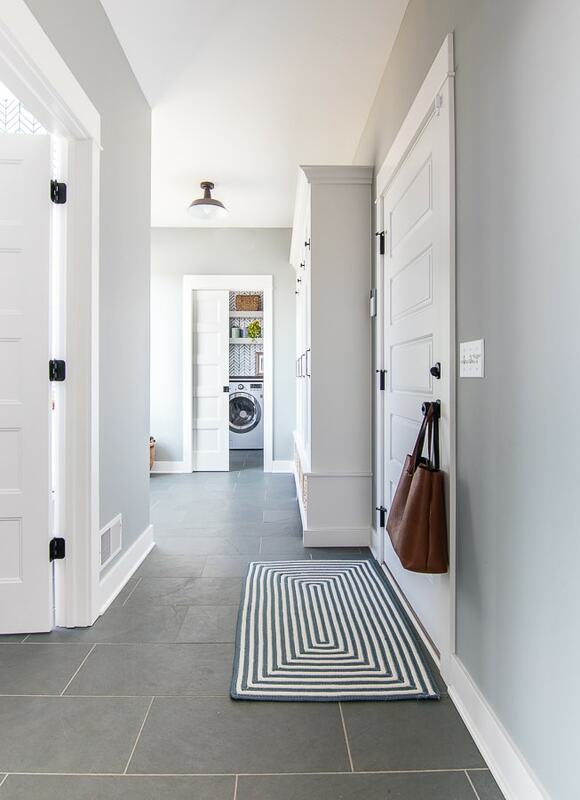 Large, lots of light, love the slate floor with grey walls/lwhite trim. Oh, and you just need to train Charlie to pick up his toys when he pulls them out and return them to the basket. A great “job” for him, he’s so cute. I’ll work on that with Charlie, he will probably just roll his eyes at me! So smart to put in built in with doors! I love the look of the open cubbies too but know they just aren’t practical, even with adults. Just love your home and all the colors throughout, so peaceful. Do you have plans for the lockers? We are putting in a mud room and my husband is going to build lockers. love yours! I don’t have plans for them I just sketched them up for my cabinet builder. They are 15 inches deep and 8 ft high if that helps. 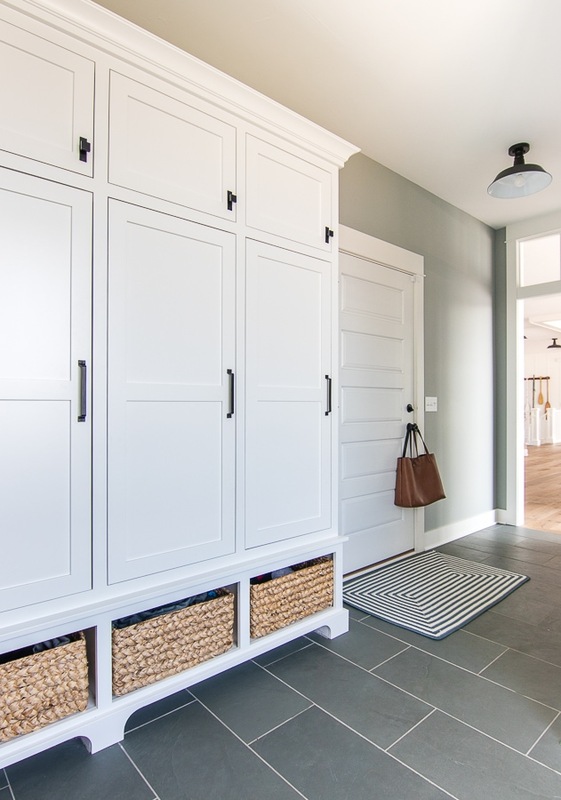 What a gorgeous mudroom! 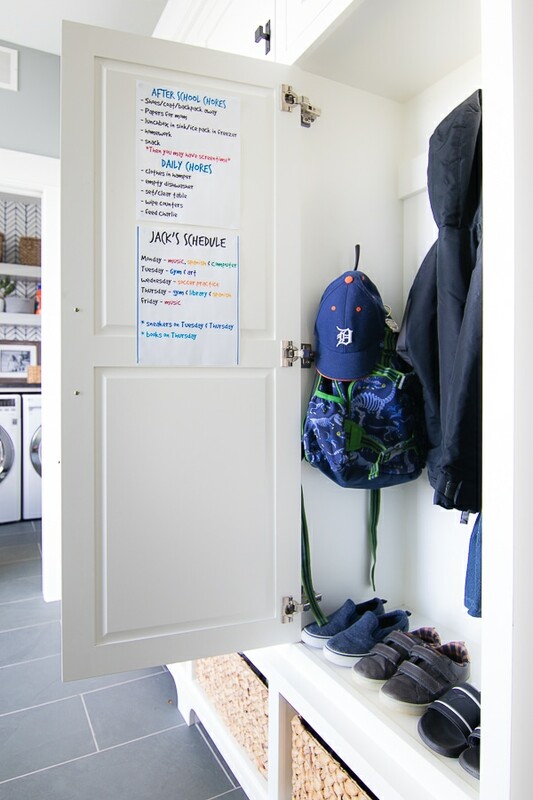 We don’t have an official mudroom – just an area of our small laundry room. I would love to have all this space and I love the way you decorated it! Hey Shelley, our last house was the first one with a mudroom and it is so nice to have! Hey my cabinet builder custom built them – thanks! Thank you for a complete share of this space. 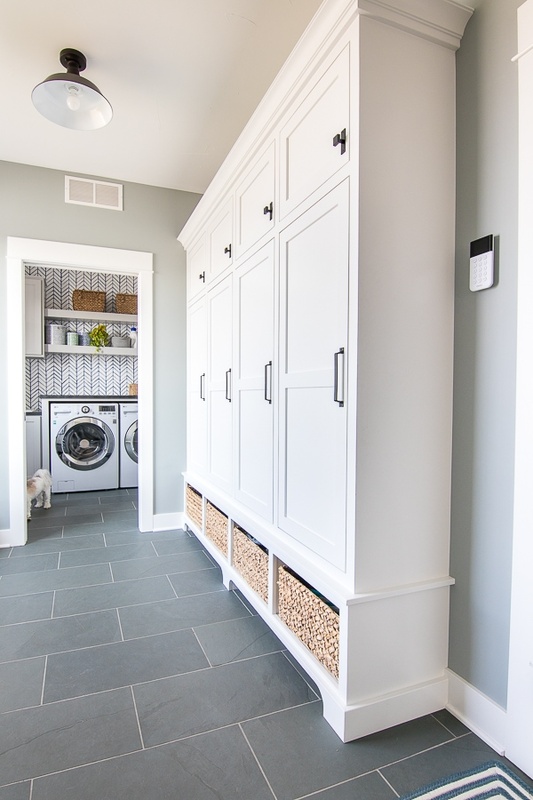 Mud rooms/laundry are right up there with kitchens and baths for important functional rooms that are fun to design. Have loved the barn lights since you first built. Are yours black or bronze? Do they provide enough light for the hall and laundry? Your home is beauty and function combined so well. Yes I’m with you it was important to hit on function in here for sure! The lights are black and they are nice and bright for our space. As I’ve said before, I love every inch of your home. 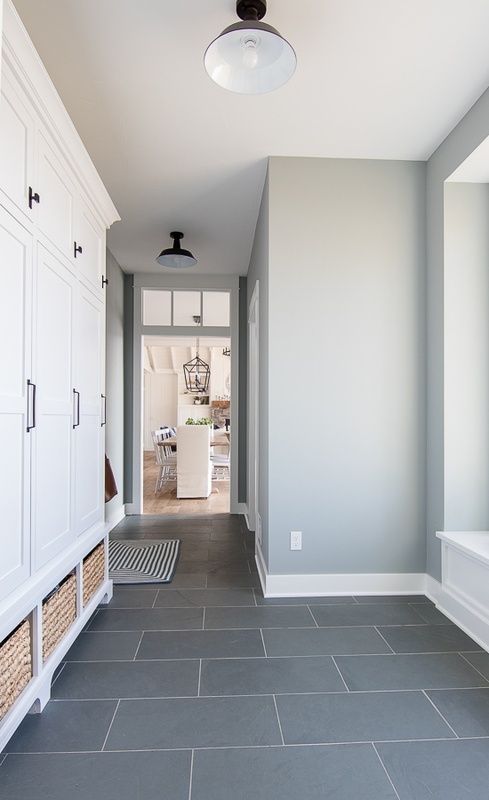 The mudroom is to die for!! So beautiful. I think I would spend a lot of time in that window seat – with Charlie! Thank you! Charlie does love to hang out up there and stalk the geese and swans. What a great space! Your choices are perfect and what a great way to teach your children organization. Children thrive on routine and you have made this functional and beautiful all at the same time. I just love everything about your home! Thanks, Jil, we are trying! My kids definitely do better with a routine that’s for sure. Love it! 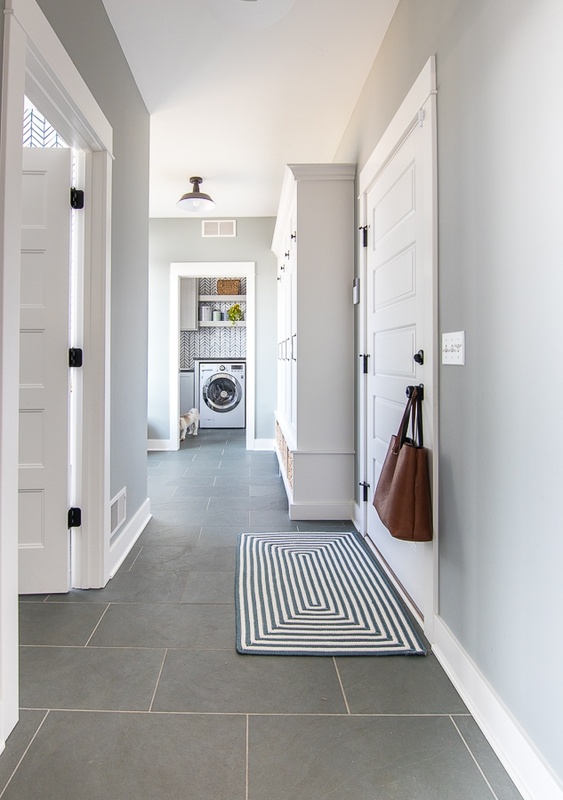 I’ve been wondering about your mudroom and so I’m glad you posted full details! I’m thinking of redoing mine, and this is super helpful. Sorry to keep you waiting! I can’t believe I didn’t cover this before ha. 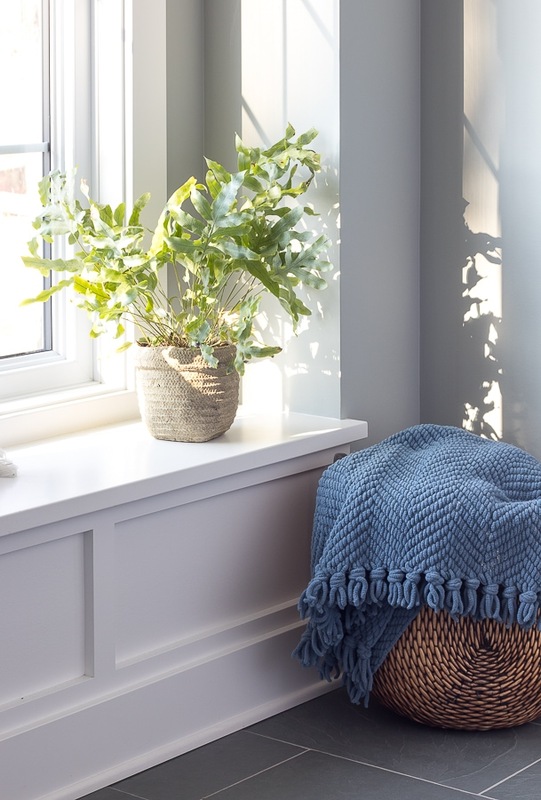 Beautiful especially the window seat!!! Kelly, you’re an incredible designer! This wing of your home is just as gorgeous as the rest and so well thought out. 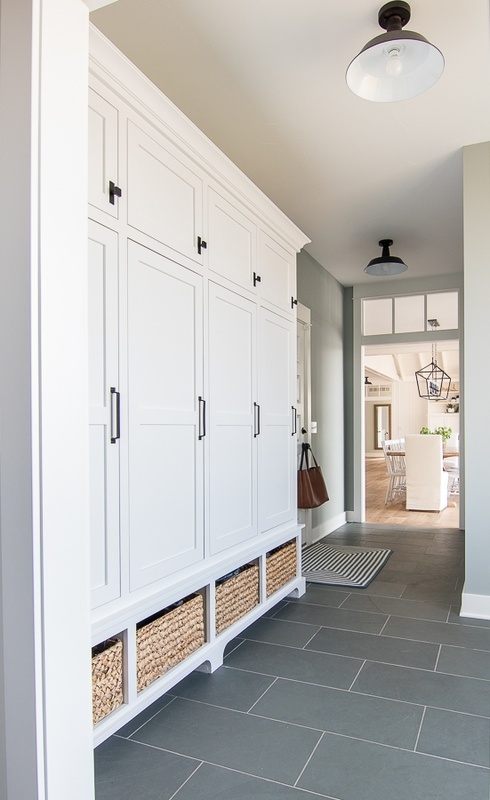 But I must ask… did you plan the mudroom cubbies to fit the baskets OR did you do a happy dance at Meijer when you found them? You are so kind to share all of your sources. This space is so beautiful and functional! Do you have a link for the hardware on the lockers? I’ve been looking everywhere for rustic black knobs and pulls and these are perfect! Thanks! I don’t I’m sorry they were from a local store and they just came in a box with no brand name on them – thanks! Hi! Loveyour mud room and every other room I your house too! 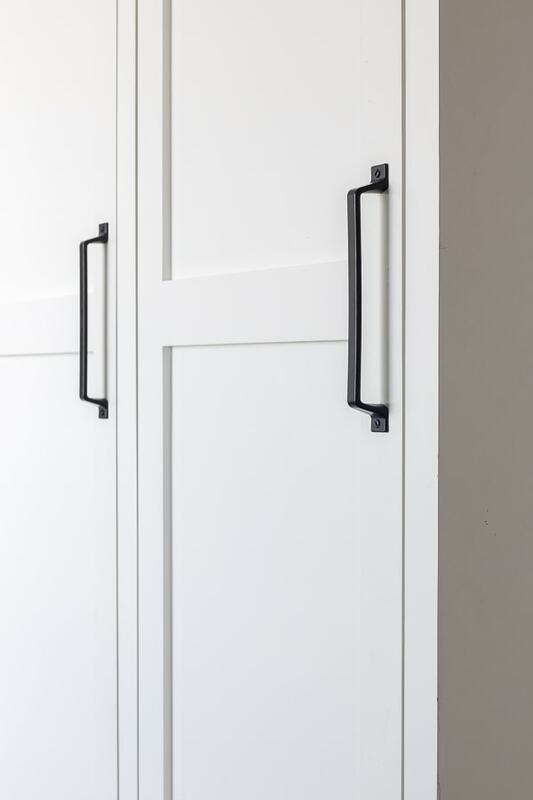 Do you know where your cabinet door pulls are from? Hey Rachel they were from a local store here in Grand Rapids sorry that’s not helpful in WA – thanks! I just got a mud room and I love it all closed storage and dark floors. I then move my laundry room upstairs and it’s so nice to have everything so close. I would highly recommend it for anyone thinking of doing this. Thanks again for sharing your home. Thanks Jony, that is nice to have an upstairs laundry room! Hi Kelly, Thanks for sharing this space. Yu put a lot of thought into its design, and it shows. Love the argument for closed storage. You converted me if we ever decide to put in cabinets in ours. Plus, it is beautiful! Question on slate – I have same tile. Agreed it shows so much dirt & grit in winter. Were yours sealed? Mine weren’t (long story of no-show tilers, just getting grout done was acfeat). How do you keep clean? Hey Julie, yes our slate was sealed. They recommend doing it every few years or so, so I’ll probably be doing it again soon. I just vacuum it and use a Norwex wet mop with just plain old water. Thanks! It’s Sherwin Williams Boothbay Gray.